Was Madeleine McCann last seen in her bed by her father, Gerry McCann, at approximately 21:15 on May 3rd? That’s the popular default narrative. That’s where Kate says Madeleine was taken from in her book, isn’t it? And it’s what the media mainstream believe, isn’t it? It’s also the contention of the Netflix documentary THE DISAPPEARANCE OF MADELEINE MCCANN that Madeleine was abducted from her bed and then through the bedroom window. Presumably this is also the main thrust of the theory of British investigators. In the DOUBT trilogy I put forward a different theory. There are a few reasons to believe 1) Madeleine never went to sleep on May 3rd, 2) if she died in the apartment, she didn’t die in bed and 3) after she died [assuming she did die] she wasn’t carried from where she fell or lay to her bed. This is a slippery line of reasoning so try to follow me. We start by looking at the crime scene photos of Madeleine’s bedroom. Interestingly, the Netflix docuseries hardly ever refers to the original police photos. It’s not terribly clear, but one can just make out a light pink object on Madeleine’s pillow. There’s also a darker pink object, a child’s blanket, in the foreground below the pillow. The light pink object is clearly sitting on Madeleine’s pillow and slightly obstructed from view by the darker pink blanket below it. Madeleine’s soft, pink Cuddle Cat toy is more evident in the images below. In dramatised versions of the scene, Cuddle Cat on the pillow and the pink blanket under it are more evident. Now in theory, this picture is precisely what we’d expect to see. If Madeleine was sleeping or in bed when she was abducted, and she was always with her toy, then the toy would have been left behind precisely where it is left behind. The problem is, cadaver odor was found on the toy – the pink Cuddle Cat – when it was searched in a separate area, the villa on Rua das Flores where the McCanns moved to a few weeks after the incident. Goncalo Amaral describes in his book The Truth of Lie how Eddie, the cadaver dog, approached the wicker chair and alerted to the toy on it. At first the toy isn’t on the wicket chair but seems to be inside a basket and under something. It’s not easy for the dog to get to because it’s sort of behind a jutting wall. The dog is nevertheless interested in the area, sniffing the curtains and the floor. Then Eddie hops up, grabs the toy, drops it, scurries off before snatching it again and dropping the Cuddle Cat in the middle of the lounge floor. The videographer is obviously stunned by this, and fixates for a few seconds on the little girl’s toy lying – cadaver-like – on the gleaming slab of floor. But the moment Amaral sketches in his book appears to refer to an alert in the kitchenette area at about 5:33. Here the dog also hops up to sniff papers before alerting loudly. Grimes clearly seizes the Cuddle Cat from behind the cupboard, in this instance, and holds it up to the camera. There’s also a moment at 3:24 when Eddie enters the closet area of the parents’ main bedroom, and spends a long time inside it on the ground level [presumably where the shoes are]. When Eddie finally emerges Grimes bends down and briefly lifts from the floor and examines what appears to be a darker pink blanket, similar in color and texture to the one seen in crime scene photos on Madeleine’s bed. Now we know that Kate washed Cuddle Cat and contaminated the toy every time she went out in public, which was a lot. So the fact that the cadaver dog alerted to Madeleine’s toy after three months of washing, contamination [including by Amelie] and airing is pretty incredible in itself. It has to do with #McCann washing Cuddle Cat twice before Madeleine's toy was tested by detectives. As soon as we regard the cadaver alert on the Cuddle Cat as genuine, we’re faced with a conundrum. It suggests Madeleine was clutching the Cuddle Cat when she died, or conversely, the Cuddle Cat was in contact with a dead person for an extended period of time. In this scenario, the deceased person was the likeliest to be Madeleine, not so? So in this scenario, did Madeleine die in her bed, with Cuddle Cat beside her? It’s certainly a possibility except for the alerts – blood alerts – behind the living room couch in apartment 5A. The mere suggestion of blood invokes the possibility of injury. And if blood was discovered outside the bedroom then there is an inference that Madeleine wasn’t in bed when she died. The cadaver alert below the balcony in the flower bed invokes the likelihood of a fall. Did she fall with Cuddle Cat? If so, if she didn’t die in her bed, then how did Cuddle Cat end up in Madeleine’s bed? There’s also another serious issue. If the dogs alerted to cadaver odor on Cuddle Cat three months after the incident, why didn’t they alert to the bed where we know Cuddle Cat was found? For that matter, why wasn’t any blood visible on Madeleine’s pillow or blankets? Well, we know from Amaral’s book that the linen on the bed was stripped and washed soon after. Amaral also raises another pickle, in the strange configuration of beds in the McCann’s bedroom. The single beds are mooshed together, but then both beds are pushed across the room leaving a great deal of space open on the wardrobe side. Enough space for the twins cots. Amaral’s makes the astute observation that it appears the twins were kept in one room with the parents, while the third child was left on her own in another room. Perhaps because Madeleine had trouble sleeping, and would rouse the others when she was in distress. Besides the possibility of Cuddle Cat developing Chucky-like self-locomotion skills and crawling back to Madeleine’s bed, there’s the question of whether the cots were trafficked back to Madeleine’s room. Why? To reinforce an impression that all the children were sound sleepers. When one slept, they all slept and they all slept together. There’s also the strange set-up of the other bed in Madeleine’s bedroom. It looks more slept in than Madeleine’s bed does. The notion that the shutter was raised and the abductor fled through the open window of the children’s bedroom has a serious flaw as well. If all three children were asleep in the same room, then opening the metal shutter would have caused it to rattle loudly as it was lifted, a risk an intruder wouldn’t have wanted to take. It would have alerted passersby in the street, other folks in the apartment complex not to mention the two children in their cots the abductor needed to carry Madeleine past on his way out the window. Kate McCann also claimed she looked under the bed for Madeleine. Not under the cots, under a bed where there was no place for a child to hide. Was Madeleine McCann last seen in her bed by her father, Gerry McCann? The twin beds are baffling. The one closest to the door looks staged of course. So it would be an easier call to say she never went to bed because that twin bed looks just turned down, staged, not slept in. But the other twin bed actually does look slept in. But one would wonder why Madeleine would choose that bed since it’s near a scary bedroom window, and furthest away from the door and her parents. One could say the “abductor” stood on that bed to make it easier to take Madeleine out the window, but it doesn’t look just stepped on, it looks disheveled. But if the portable cribs were not removed then it would be a lot more difficult for Madeleine to navigate out of her bed (closest to the window,) and around the cribs to search for her parents, then take a tumble down the stairs. And if the cribs were removed then it would not be difficult but then we’re back to Madeleine having gone to bed that night. Gerry would have to put the cribs back in the children’s bedroom, stage the bed closest to the door with blanket and toy – but why does the other bed look slept in? How often did they have room service? One of those beds would always be made wouldn’t it? All I can say is the fact that the cuddle toy has cadaver smell on it implies bed one is staged and she didn’t sleep in that bed, but what of the other bed? One last thought – could the dead child have been placed in the garden area just prior to moving her to another location, or is that too risky? I can’t help but think if she died before going to bed it could have been from another kind of fall – against a surface in the apartment or from a shove, on Kate’s watch. Gerry, however could not have seen her sleeping in either bed for the reason that cuddle cat had cadaver smell on it and she I presume, slept with her toy. At the least she would have had to have died in bed and Gerry wouldn’t have known she was dead and not sleeping on his check up unless he had actually gone in the room and checked all three for a pulse. Then she turns up missing. Their story doesn’t fit the evidence. Years ago there was speculation that Maddie had died of a Capol overdose. The theory being that she was given a dose that at home in the UK was perfectly fine for her but away in Portugal was fatal (in addiction science, it’s a known fact that for instance a heroin addict can take a certain amount at home but if going to another city to visit a friend will overdose on that same exact amount ). The blood found on the wall was surmised to be from one of the physician parents attempting to do an emergency tracheotomy. The cadaver dogs, in this theory, alerted in the garden where Maddie had been placed for a short period by the father as he prepared to take the body and hide it. Thank for sharing your observations guys. One of the early theories, in fact I think it was fielded by Amaral himself, was that he thought Madeleine may have tried to climb onto the blue couch to open the outside window. There’s some credence to this because Gerry was supposedly talking on the road for some time, right outside that side of the apartment, down in the street. Madeleine may have heard him, climbed up and slid down between the couch and the wall, and broken her neck. It would certainly account for how the blood evidence got there. Although it’s not a bad theory, I have my doubts that a less than 1 meter fall could kill a child. If that was the case couches worldwide would come with railings, safety nets and disclaimers. We would also expect to have heard a shout when she fell, and would expect that she didn’t die instantly. 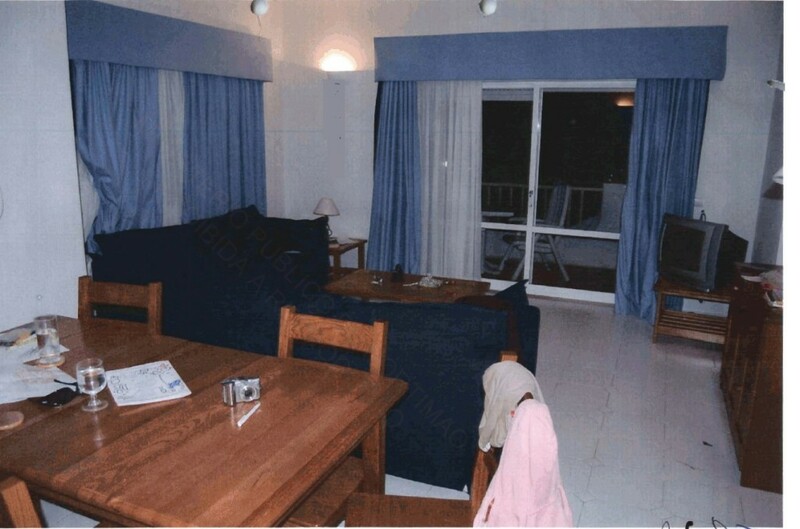 In one of the crime scene photos it also looks as if the curtain is folded in slightly [on the left side]. Also, how would a fall from that short a distance leave a bloody wound? I agree that the bunched-up curtain looks very suspicious. So according to that theory, it was Gerry who discovered that Maddie was dead and decided to dispose of the body without telling his wife (the person supposedly seen awkwardly carrying a sleeping child toward the beach). So when she discovered that Maddie was missing when she went to check on the children, her reactions were genuine. It was only later that she learned the truth, from Gerry, and decided to join in the coverup. Not sure where any theory mentioned Gerry not telling his wife. why wouldn’t they just call the police upon discovering that their child had had a fatal accident?>>>That’s a good question. Same applies to the Ramseys and Casey Anthony. Can you think of why someone might not call the police after an accident? Oh, yes – but not for any *noncriminal* reason. When the accident occurs under conditions which would make the person/persons look criminally culpable/negligent. It’s very hard for toddlers to die from any fall (they’ve been know to die from being thrown down a flight of stairs, but that’s not simply falling) as they are short and compact and hence less vulnerable than big, clumsy adults. Certainly a 3 year old can weather a fall from a low couch (ours did numerous times). CBH – that aspect of addiction is really interesting. I wasn’t aware of that. Thanks for sharing. You’re entire comment kinda gave me the chills as it relates to Madeline. Wow! Yes, a psychology professor first informed me of that fact, and I found it stunning that the body reacts to a different environment by processing a drug differently. Yes, so I don’t think she fell from the couch. I like the idea (not the thought of course) that the sedative from the night before hadn’t fully worn off – she was tired all ready – before bed – in fact Kate says they cancelled the trip to the recreation center because everyone was too tired – that includes Kate too I would imagine. If she was then given another dose of the Capol and feel asleep before the end of the bedtime story then she would be doubly sedated. However, I do not think she made it to bed. If one wants to make a comparison between scenarios, JonBenet’s bedroom, and Madelein’s, one of JonBenet’s twin beds did not look slept in, it was used to throw all manner of clothing and bric a brac on, but even the bed she did sleep in didn’t look slept in, rumpled, yes, but not slept in – due to a pillow being at the bottom of the bed and a bedlight remaining on which was seen as on in the morning when police were called. Other reasons too, which are gone over in Black Star, Sequin Star, and other books. As well as Steve Thomas’s observations. Wasn’t JonBenet’s bedroom window sash askew as well? Keela alerted to blood so an injury is likely. No blood on cuddle cat though – right? But cadaverine. So I suspect at the very least she was “stashed” behind the sofa for a period of time, but cuddle cat was with her when she died or placed with her. Could the accident have happened in the tub? Might she have slipped and fallen inside the apartment due to her groggy state? Make no mistake it’s difficult looking after 3 children, very small children, on your own – and Gerry was “otherwise engaged” at the time possibly. I think the usual routine of going to the restaurant, making their nightly checks, was “used” and as bad as that sounds for them, they had to continue on with it in order to put together their abduction ruse. But to answer your question, was Madeleine last seen in bed by her father Gerry? I would have to say no, because he didn’t actually “see” her in bed now did he. He didn’t go inside their room, he merely adjusted the door and used the bathroom. Or so he says. But when did anyone see her alive last I don’t know, or where. The important fact to establish is when Madeleine was seen alive by someone besides her parents and the Tapas 7. That turns out to be a very difficult assignment, and requires – as you can imagine – meticulous, methodical and systematic research. There are some who believe Madeleine actually died a week earlier. It’s an absurd idea, but it illustrates just how much uncertainty there is around when she was last seen, and by whom. It also raises suspicion around a pretty obvious area – why were so few photos taken of the family holiday, and if more were taken, what happened to them? In the photo posted in the previous comment you can see the McCann’s silver Canon PowerShot A620 camera on the table. It’s unfortunate the cops didn’t seize it from the scene there and then. The absence of family photos is another theme the McCanns have in common with the Ramseys. may have sedated her to keep her asleep. Very sad! and covered this up, dumped the body. far. I am just starting to read Doubt. How do you explain the blood traces behind the couch – if it was only a sedative overdose? provided us more clues as to when Madeleine was last verified to have been seen by someone other than her parents or even their friends. I’ve seen the video of Maddy climbing aboard the plane to go to Portugal, but I understand that the dates of photos taken after that have been called into question, i.e., there might have been some deliberate fuckery with the metadata of the vacation photos, including the purported “last” photograph. Let’s say she died several days before May 3. Were the twins taken to the day care place (whatever it was called) and not Madeleine? I don’t think it likely Madeleine was dead for more than hours on May 3, not days. As long as they didn’t run into the other Tapas 7 out and about then I suppose they could get away with a two day missing child but the fact that they circled their wagons (Gerry and Kate) and showed up for dinner May 3 suggests to me her death was likely before their dinner plans, and not after, and also not days before but earlier in the day. Just because people would ask where’s Madeleine, why didn’t you bring her to the day care, or one of the other doctors who saw Gerry playing with the kids in the park for example, and Madeleine wasn’t there, would have asked. What is worrisome to me however is Matt Oldfield’s volunteering to check on the kids in between Gerry and Kate’s check-up – especially since he didn’t actually LOOK. Why go to the trouble of walking back to their apartment if he wasn’t going to properly look. Just as a practical matter no one in their right mind would sleep with a dead body stuffed into their bedroom cabinet, or move about with a dead body behind the sofa. There is the matter of smell. Also a wobbly child who has been given Capol I wouldn’t think would be given it in the middle of the afternoon, but certainly would in preparation for bedtime. That’s very obvious of course. So the not so obvious might have been in play here, like an accident that was not intended to kill, but an angry release of frustration. Anyway, still mulling it over. Oh, and one last one – “They’ve taken her.” Why is it always a “they”, and in the Ramsey case, a foreign faction. It doesn’t take several people to kidnap one child. Yet the word “they” or “we” is always used. Obviously the McCann’s planned out what their scenario would be, the invisible “they”, before they set themselves down for dinner. Firstly, it’s been established that the family were seen by witnesses other than their friends having high tea. We know that kate left with the children and returned to the apartment at 6pm. Witnesses placed Gerry at the tennis court at 6.30, from then on we only have their account and the friends account that he called in on kate and Gerry returning at around 7pm. A study was done using 52 of the best cadaver dogs to see at the earliest how long a body needs to be left before cadaverine is detected. The very earliest was 1hr. 25 mins. The other dogs on average took 2-3 hrs. Here’s my problem, I believe in the dogs but how is this possible with the timeline? You’ve raised some good points. And I agree with you, I think for cadaver odor to form a body has to be in place for 2 or more hours. If the body was “abducted” any time after 21:00 [which is likely] then working back 2 hours you get 19:00, or 3, 18:00. If the “abduction” occurred shortly before 22:00, then possible time of death moves to as late as 19:00. Using the abduction window [21:00-22:00 and more likely 21:30-22:00] there is [I suspect] a sufficient window for cadaver odor to form. Ah but unless you believe the parents planned to murder madeleine, how do you account for the fact that if this was an accident, it would have to have occurred almost immediately on kates return with the children. Unless madeleine was drugged by her parents, there is no reason why they would cover up her death and call for help. In this timeline of events, Gerry would return from tennis, find his daughter is dead, then need time to process this, think what to do, decide where to hide her, go out and dump the body, come back, shower, dress and compose himself. No reports of their behaviour at the tapas bar were any different to any other night which is quite remarkable considering they are not regular expert criminals. If in fact the decision was to dump the body later on one of the checks, I really find this and stretch to believe that he could possibly have dumped her somewhere even nearbye in the time gone on each check. This coupled with the police searching every nook and cranny they could within the local area seems highly unlikely to me they would risk that. I also feel that if they wanted her dead there are far easier ways of doing it such as pushing her off a cliff and saying she fell. Then we have to look at ther statement that madeleine reported why didn’t you come when she and one of the twins woke on a previous occasion, if they wanted to medicate so the children slept, why only madeleine? The twins had no detectable drugs in their bloodstream. The Mcann’s had no way of knowing that the friend that checked on the children wouldn’t look properly, why would they allow him to go and check when they hadn’t yet gotten rid of the body? If madeleine was moved from the apartment before this check then the timeline of the cadaver scent doesn’t work unless the dogs are wrong. To me, given the best timeline of events even with a bit of room for slight error, there just isn’t enough time for the parents to have done this. I really find this and stretch to believe that he could possibly have dumped her somewhere even nearby in the time gone on each check. There just isn’t enough time for the parents to have done this.>>>It does seem unlikely, doesn’t it? Ergo, the dogs must be wrong, ergo there must have been an abductor. And we know this…how? The twins were never tested for anything. That certainly isn’t what police do when they are called in to find a missing/abducted child, immediately take blood samples from all the family members. See how weird that statement looks now? The parents and the twins slept in the children’s room while the girl’s body was possibly hidden in the main bedroom’s closet.